Fourth Row Center: Film Writings by Jason Bailey: On DVD: "Despicable Me"
Making computer-animated family comedies for anyone other than Pixar must be a little bit like being a member of Gerry and the Pacemakers back in 1964—yes, yes, your band is very good, your songs are catchy and enjoyable, but you’re trying to make Beatles music, and c’mon, you’re not the Beatles. Despicable Me, the debut feature from Illumination Entertainment, is bright, cheery, and frequently funny. But it ain’t the Beatles. 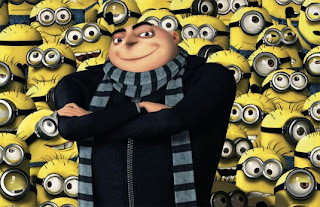 Steve Carell voices the protagonist, a would-be supervillian named Gru. Gru enjoys villainous acts big and small (in his first scene, he makes a balloon animal for a little boy, then delights in puncturing it with a needle), but he’s been shown up by a new kid on the block: Vector (voiced by Jason Segal), who has stolen an Egyptian pyramid. In frustration, Gru and his Q, Dr. Nefario (Russell Brand), hatch a scheme to launch a rocket and steal the moon using a shrink ray stolen from an East Asian testing facility. But Vector swipes the shrink ray from Gru, and the only way he can think of to penetrate Vector’s fortress is by enlisting, unwittingly, the help of three orphan girls who have sold Vector a payload of cookies. Gru adopts the girls, figuring he’ll care for them until he gets the shrink ray back. Of course, this being a family animated comedy, he learns to love them, and vice versa. Directors Chris Renaud and Pierre Coffin have got a disarmingly cockeyed visual sense, and the picture is, on a very basic level, fun to look at; the character designs are ingenious, particularly Gru (with his bald head and carrot-like nose) and his minons, the tiny, round, yellow sidekicks who act as assistants, gophers, and cheerleaders. Carell, doing a strangled, vaguely Slavic accent, is an engaging lead—he gets the menace just right, so that the softness underneath isn’t a hard turn. Segal, meanwhile, is clearly having a great time (“Curse you, tiny toilet!”), and Brand, Kristen Wiig, and Julie Andrews pull plenty of their own laughs. Danny McBride and Mindy Kaling, however, are wasted in brief, joke-free roles. The kids (voiced by Miranda Cosgrove, Dana Gaier, and Eslie Fisher) are charming—there’s an abundance of dry wit that verges, but never crosses, the too-clever-sitcom-kid line—and there are a couple of wonderful little sight gags, regarded but not overdone (Gru goes for a loan at the “Bank of Evil (formerly Lehman Brothers)”; a minion DJ plays music on “Gru-Ray disc”). But the minions are overused, Will Arnett is given nothing to do, and as clever as the picture occasionally is—and it occasionally is—it isn’t nearly as clever as they think it is. It entertains, to a degree, but it feels too often as though they’re coming up, somehow, just a little short. Released the same summer as Toy Story 3, Despicable Me can’t help but suffer in comparison—the humor isn’t as smooth, the animation isn’t as eye-popping, the pathos aren’t as touching (not by a long shot). It’s not the fault of these filmmakers that their picture doesn’t quite measure up to the competition; that’s just the way these things work out. Despicable Me isn’t a bad movie. It’s cute. It’s pretty. It’s just fine. But that’s about it. "Despicable Me" is available now on DVD and Blu-ray. For full A/V and bonus feature details, read this review on DVD Talk. On DVD: "Groucho Marx: TV Classics"
In Theaters: "True Grit (2010)"